It was so great meeting you two tonight at the Nuclear Panel and at Ivana’s dinner. 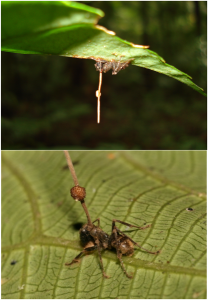 I can’t believe my writing class essay topic on the Cordyceps is so relevant to your current work on this blog! In short, this project aims to learn more about how a relatively “simple” organism such as a fungus can establish mind-control in a relatively much more “complex” organism such as an ant.